August bumps along nicely for bulls. How did the Stockcharts.com ers see it? My country did not send me seven thousand miles to start the race, they sent me seven thousand miles to finish it. This week brought more bullish signs with it. On 8/5 the DJIA got a bullish Aroon cross on its daily chart, then three days later it confirmed a new up trend as the Aroon up rose above 70 and the Aroon down fell below 30. 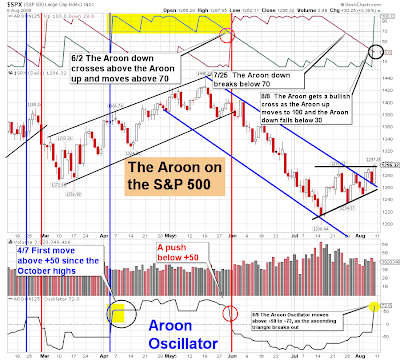 The Aroon oscillator confirmed the move as move above +50, signaling a new up trend. The S&P 500 followed the Dow on 8/8, as it got a bullish cross and confirmation of a new trend all in one day. Moreover, both the DJIA and the S&P 500 got a bullish cross on the ADX indicator in the daily timeframed. The direction movement indicators (DMI) on the ADX, got a bullish cross on Friday. The positive directional indicator (+DI) crossed above the neagative directional indicator (-DI). 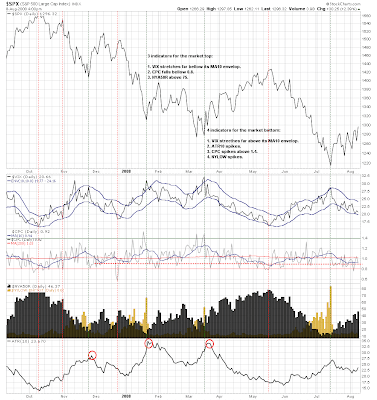 We have continued to witness the ADX line plunge, signaling that volatility is on the decline. The ADX measures the spread between the DI lines. However, we may experience so crisscrossing of the DI lines as the bulls build a base of support. So we continue to see that the trend based indicators all confirming this reversal and rally. The MACD, the TRIX, the Aroon and the ADX. In Addition the McClellan Summation Index and the S&P 500 stocks above their 50-day moving average adds further validity to the trend based indicators that a new up trend has been born. At the beginning of the week, we saw the DJIA and S&P breakout of the falling price channels. 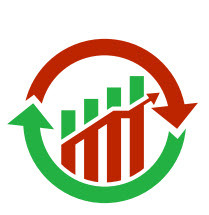 More bullish signs occurred on during the latter part of the week, when the 10-day EMA rose above the 20-day EMA on both the DJIA and the S&P 500. Then on Friday both indexes broke out of their ascending triangles that have formed on the daily and 60-minute charts. So we continue to see higher highs and higher lows in the daily timeframe. We also saw prices finding support at their 20-day SMA on Friday and then bouncing of it in strength. Both the DJIA and S&P got bullish engulfing patterns. You may recall that I said that investors needed the weekend to digest the positive GDP data and better than expected nonfarm payroll number. I anticipated investors would jump on board early in the week and they did, after a crucial test of support on Monday. The QQQQ has taken a leadership role getting a bullish cross of the 10- and 20-day EMAs at the beginning of the week and breaking out of its ascending triangle 2-days before the other averages. Resistance at $46.15 has now turned support. Additionally, the Qs got a bullish cross on Tuesday 8/5, giving us an early warning that the other averages could follow suit. The Qs 60-minute chart suggest that prices will backtest to 46, which is the upper boundary of the ascending triangle. Because the MACD is extended and the histogram is sporting negative divergence, as the its stochastic is overbought. However, that may not take place until Tuesday or Wenesday. The DJIA and S&P 500 will likely get a follow-through of their Friday breakouts on Monday. Once prices move a bit higher, I am confident that prices will backtest the breakouts in order to reset oscillators. Another positive thing about all of the breakouts that we have seen, from the breaking of the decelerating trendlines to the breaking of the falling price channels and that is that volume trends continue to be good and even historical. The weekly charts are the key though. The weekly charts of the Nasdaq, Transports, and Russell 2 K got bullish MACD crossed and saw their histograms move into positive territory. The Qs & Nasdaq weekly charts had the Force index move into positive territory, officially giving control of technology back to the bulls. The Force index on the Transports turned positive last week. 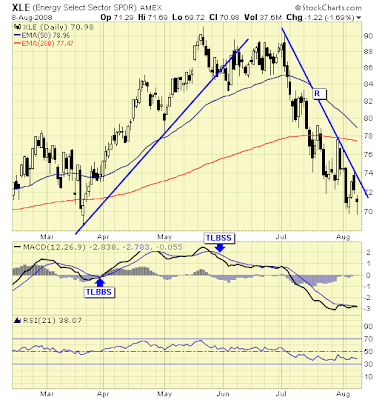 The transports weely chart continues to give the appearance of a huge cup with a handle pattern. With the handle being formed at this time. Watch for a move above 5536, which was the previous high. Since the March lows the transports have outperformed most stocks and averages. And the 10-week EMA remains above the 40-week EMA, unlike the other averages. Crude oil closed at 115 on Friday, falling slightly below its 50 % Fibonacci retracement from the February low. The double top pattern I called on July 15 has played out with the most remarkable accuracy, thanks to the assistance of our candlestick patterns. The dollar also rallied this week as oil plunged, allowing it to breakout of a long term double bottom pattern. So crude oil declined by 10 dollars for the week and fell by 7.91 %, as the dollar rallied 2.42 points and gained 3.29 %. I do believe that crude will attempt a recovery to ultimately test the 130-135 area, which is at the broke intermediate trendline. We have seen future expectations of quantity have a direct effect of immediate prices of crude futures, cause most of the gains made this year to be erased. By the way, hats of the Republican rebels in the house of representatives, who are not going on vacation until the Democrats come back from vacation and give them an up or down vote on offshore drilling. The Republicans got the message, that the American people are fed up with paying for high energy. Now it is the Democrats playing politics, because they are beholden to so many radical environmental groups, who don't want off-shore drilling to occur. The Republicans are in the house with the microphones and cameras off, so I'm not sure how many folks are aware that they have stepped up to the plate to do the right thing for the American people. I hope our Democrat representatives will go back to the chamber and pass the energy bill. I continue to believe in this rally and I don't believe we will get the 32 to 45 % drop that is typical with bear markets. But I am a realist, if the S&P 500 cannot break the down trend in the weekly timeframe during our next run or ultimately exceed the May highs, then the bears could get their bear market. Personally, I don?t think they will get it, but if they do it would likely be a result of the growing tensions between Israel and Iran. Israel is bolstering its ability to strike Iran in preparing to cripple Tehran?s atomic program. Israel has purchased 90 F-161 fighter planes that have the capability of reaching Iran. And they have purchased two dolphin submarines off the Germans, which can fire nuclear-armed warheads. I am concerned, because the Israelis think it might be in their best interest to launch an attack against Iran, while President Bush is still in office. In hopes of having US support. 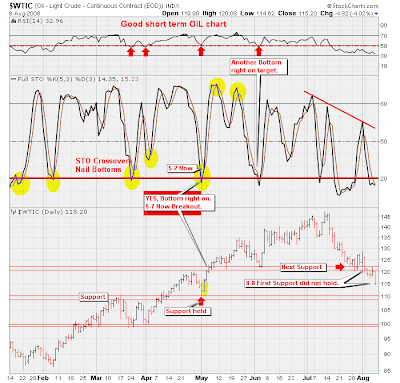 Lets continue to monitor this closely, because it could greatly effect crude oil and world markets. Has ATR peaked sufficiently for a bottom? 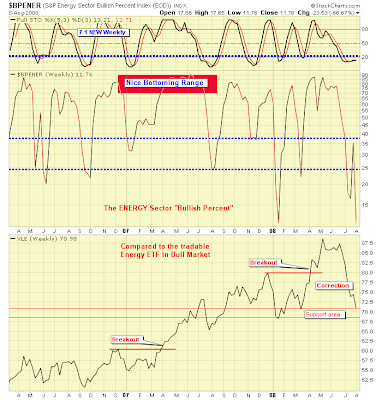 Energy Bullish Percents offering value? Note presence of 2007-early 2008 support. Finally, Richard Lehman had this to say? 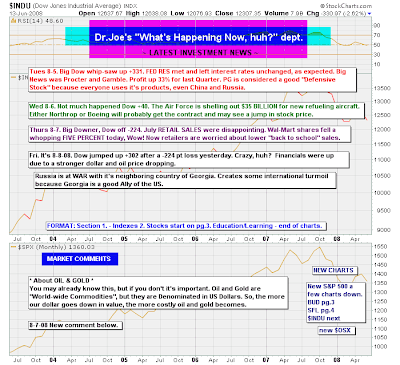 8/9 -- A surprise ending to the week turned some extremely brief mini downchannels back into upward spikes, though changing little in the bigger picture except to extend the rally off the July lows in stocks (particularly small caps) and the sell-off in commodities like gold and oil. For perspective here, even with this move, the Dow is up about 900 points off the July lows now compared with a similar move off January's lows that went up about 1100 points. (See the daily/one-year chart) So while the rally seems to be extending, it is not out of line with recent history. Another great point was made in Barrons: In the 2000-2002 bear market, there were twice as many 300-point UP days as DOWN days!! We are approaching some significant lines in the longer term charts. GLD will hit an important support line at around 82. The Naz has a resistance just above at about 2420 and an even more major one at about 2490. 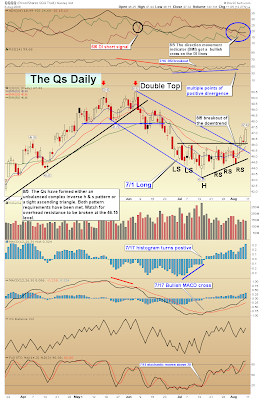 The QQQQ has already accelerated through upper resistance, but hits major resistance at about 49. The Russell will hit its major downline at 750 or so. The XLF had already hit its 6-month line and backed off so far. Its always good to keep the big picture in mind.